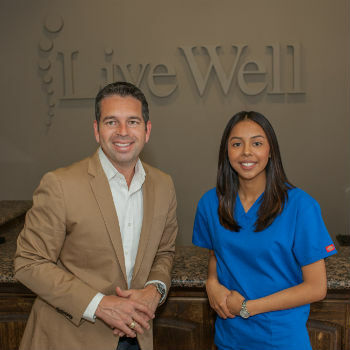 Since June of 2013, Live Well Family Chiropractic has been helping the Houston community live well. With years of practice and great results, Dr. JD Haynes is more passionate than ever about helping patients like you. Eat Well. Move Well. Live Well. Chiropractic is all about restoring health and healing in the body. At Live Well Family Chiropractic, the focus is on helping your body heal naturally, just as you were designed to. We emphasize the importance of improving your health in an effort to reduce the risk of pain and illness in the first place. Dr. Haynes uses chiropractic care to improve health and wellness in all areas of your life…whether you’re having aches and pains, or just want to start feeling better when you wake up in the morning. We take a “whole person” approach to your care. This means we look for the underlying causes of your discomfort as opposed to just treating your symptoms. Many seemingly unrelated symptoms often arise from imbalances in the spinal column, and Dr. Haynes will be able to determine the root of your pain and create a personalized wellness plan to suit your exact needs. I absolutely love volunteering at shelters throughout Houston. I love being a part of the community and giving back however possible. Live Well Family Chiropractic was built upon three principals: faith, family and community. Surrounded by friendly neighborhoods, we focus on helping pregnant women, children, athletes and entire families live well. Dr. Haynes enjoys uniting his team and patients to help volunteer in the community together. He gives back by partnering with Habitat for Humanity, Star of Hope, Faith Center and The Beacon, as well as giving free office visits to patients who volunteer alongside him. As the official chiropractor of HURT Rugby, Dr. he enjoys helping keep athletes in great shape too! Contact Live Well Family Chiropractic today and wake up ready to take on the day!